In response to one of my blog followers, I'm going to talk about my tattoo. First of all, why did I get a tattoo? I'm a pretty normal dresser - I just wear everyday clothes - nothing outrageous, unusual or particularly bold and striking. But I suddenly developed an interest in a feminine tattoo. I wanted to do something courageous and out of the ordinary. I've always been a cautious person but I wanted to do something that breaks the mould. Especially because most of the circles I've been in have been religious people. Tattoos were not the usual thing. And I wanted to break out. I'm a bit of a rebel, lol. But I didn't do it for years. More because I couldn't decide what I wanted to get. I knew it would be for life so I didn't want to regret my decision. I used to trawl Pinterest to find a tattoo I liked, but nothing struck me. Then I read a book about someone who'd been through a similar spiritual experience to me - the need to leave the church and the pain that came along with it. She found healing through several things that happened in her life and things that she discovered about her spirituality. I wanted that. A spiritual leader said she was like the phoenix/peacock which rose from the ashes out of brokenness. I desired the same. 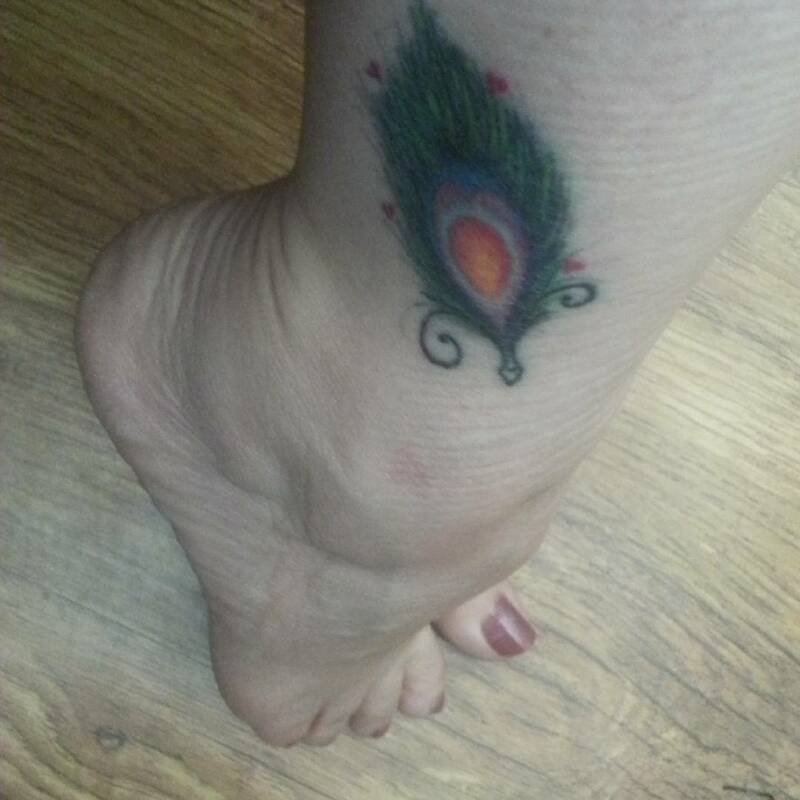 I found a peacock feather tattoo online and loved it. Then, in November, when we went for a family holiday down the coast, we found a tattoo shop that looked professional and their tattoos seemed to be quality so I decided to do it then. I had already designed my own tattoo that had a peacock feather and quill but it didn't look so good so I decided not to use it. 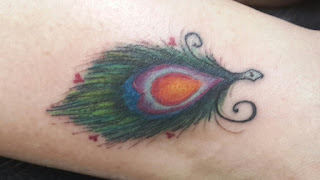 I showed the tattoo artist the peacock feather tattoo I liked on Pinterest and explained all the changes I wanted. I wanted a heart in the centre to represent my heart and four hearts around it to represent my family. I also wanted a quill on the point of the feather to represent my writing and my inspiration. I'd also read up on peacocks and their meaning - they speak of resurrection or rising from brokenness, of new life, of an eye opening to spirituality and goodness and kindness. I believed I was rising out of my brokenness and finding a new spirituality. I knew it was the right time to get the tattoo. Yes, it was. I cringed quite a bit. And it was sore afterwards, not like someone told me. It felt better after a week and I had to tend it with cream and put my feet up a bit, but it was worth it. I love it! And I don't regret it. A tattoo that represents everything you desire. Always a good thing. It's pretty and unique. I enjoyed your tattoo journey. I love peacocks. What a beautiful tattoo, Kathy. I'm not going to pretend I full understand your reasons but as long as you're happy and content, that's all that matters. Congrats! And thanks for sharing your reasons. Great to hear your story, Angele. Glad you did it and felt happy with it.